March 29, 2010 - PRLog -- Further expanding its portfolio of test and measurement solutions, Chroma ATE has announced the newest member of its PXI series, the 52401. 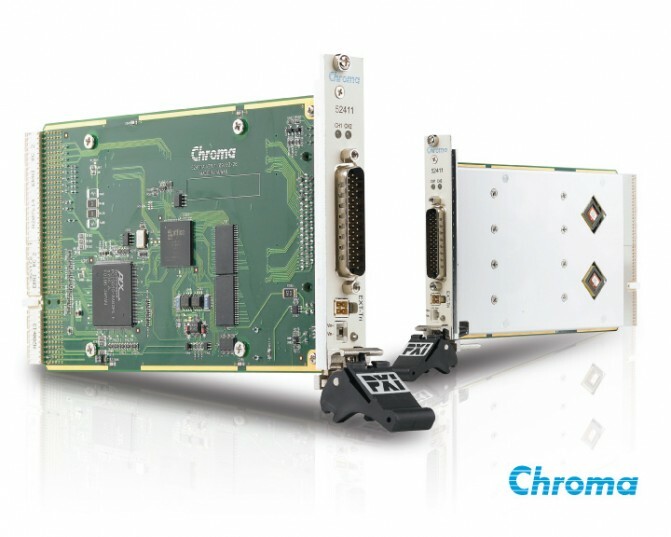 The Chroma 52401 is a single slot 3U PXI card that can host two programmable source/measure modules. Each source measurement unit is independent, isolated, and supplies full four-quadrant ±25V at ±200mA. Each SMU has its own output connection through 6 wires, ±force, ±sense and ±guards, maximizing precise measurements. The 52401 is able to force voltage or current and measure either voltage or current, FVMI or FIMV. Both force and measurement circuitry utilize 18 bit DAC/ADC. The 52401 features 7 current force/measure ranges, from 200mA to 200nA, with resolutions as low as 1.6pA. There are 6 voltage forcing ranges from ±25V to ±0.5V. Twelve full scale voltage measurement ranges, ranging from ±25V to ±5mV, allowing the user to maximize the resolution readings. The 52401 has a built in patented hardware sequence engine that uses deterministic timing to control each SMU allowing for cross module/card synchronization. The 52401 is immediately available worldwide with a list price of $3950 USD. To purchase, contact Chroma directly at 1-800-478-2026, or visit their website, http://www.chromaus.com.